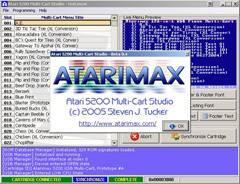 Atarimax "128-in-1 USB Flash Cartridge" is a professionally produced Atari 5200 Flash Multi-Cart with on screen menu software and a fast USB flash programming interface. The cartridge includes professionally produced Multi-Cart Studio software and custom device drivers for Windows Vista, Windows XP, Windows 2000, Windows ME and Windows 98. Adding one or two ROM images typically takes 4-6 seconds and your 5200 on-screen menu is automatically updated! On screen menu software is 100% field upgradeable and each cartridge includes its own unique internal serial number that is displayed each time you plug the cartridge into your PC! The complete kit sold below has everything you need to get started including USB Cartridge, USB Interface Cable and Software Installation CD with software and drivers for all USB enabled Windows PCs. Orders for the Atari 5200 128-in-1 USB Flash Cartridge will be accepted at the special pre-order price of only $129.99 until the first 100 cartridges are sold, or 04/30/2019, whichever comes first. After the sale ends the price will increase to $149.99. Cartridges are IN STOCK for immediate shipment . 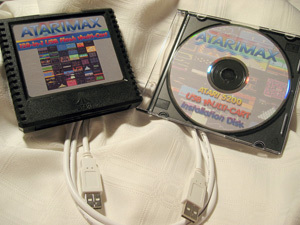 Future updates will be provided free of charge to owners of the Atarimax 5200 USB Flash Multi-Cart. A huge thank you to Corey Koltz, Chris Helmstetter, Mike Roberts and Barbara Peters for thier help in beta testing the hardware and software you see here.